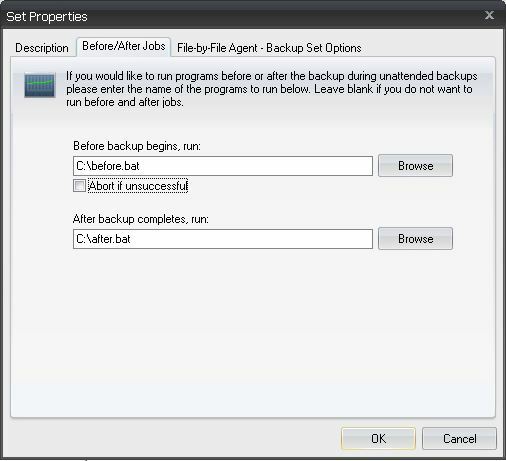 UltraBac has the ability to launch scripts or batch files before a backup set runs and after the backup set completes. This can be used to create and run customized scripts to stop the services of a relational database before the backup begins, or run any other commands that can be issued in a scripted format. Create or open a backup set. Click "Action"/"View Backup Set Properties." Select the Before/After Jobs tab. Browse to or enter in the path to the script(s) to be run during, before, or after the set is backed up. Fig. 1 - Before/After Jobs tab in the Set Properties. NOTE: Before/After Jobs are only executed when the set is run as part of a scheduled backup. Open the properties of a scheduled backup. Check the box before the "Run Before job" or "Run After job" fields to enable the appropriate type of job. Browse to or enter in the path to the script(s) to be run during, before, or after the scheduled job in the appropriate field. Fig. 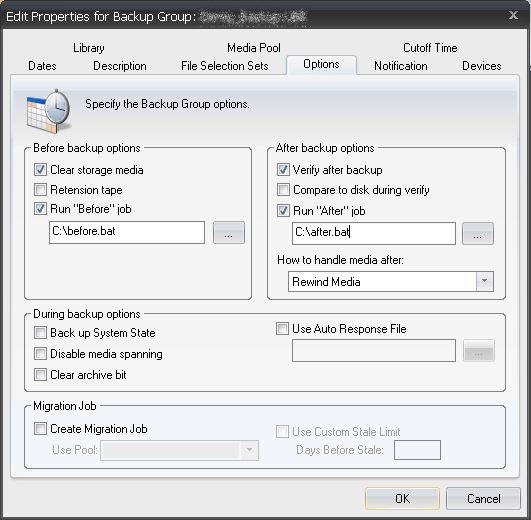 2 - Options tab in the properties of a scheduled backup.